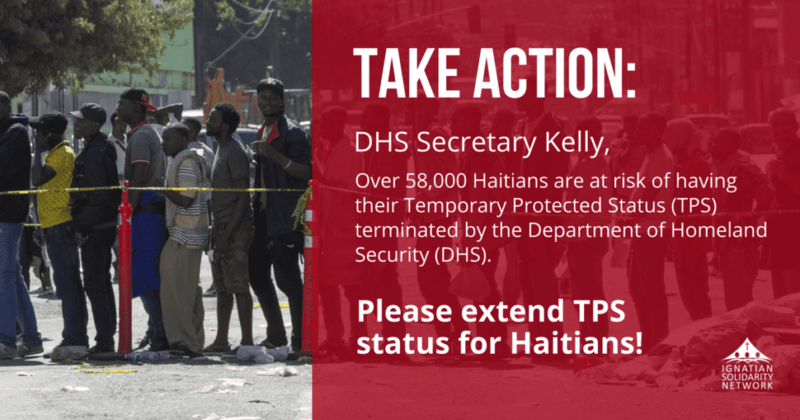 Over 58,000 Haitians are at risk of having their Temporary Protected Status (TPS) terminated by the Department of Homeland Security (DHS). TPS allows these individuals to temporarily remain in the United States and support themselves legally while Haiti is being rebuilt. Haiti is still recovering from the devastation of Hurricane Matthew, which struck in October 2016 and is said to be the nation’s largest humanitarian emergency since the 2010 earthquake. Additionally, Haiti is plagued with a severe cholera epidemic and food shortages. Unfortunately, there are reports that certain high-level government officials are recommending that TPS be terminated for Haitians. The Ignatian Solidarity Network joins the U.S. Conference of Catholic Bishops/Migration and Refugee Services (USCCB/MRS) strongly opposing this the termination of TPS for Haiti. The USCCB recently joined Catholic Relief Services, Catholic Charities USA, and Catholic Legal Immigration Network to send a letter to Department of Homeland Security John Secretary Kelly urging him to extend TPS for Haitians. Read the letter here. Secretary Kelly also needs to hear from constituents around the country. I write as a concerned Catholic to urge you to extend the designation of Haiti for Temporary Protected Status (TPS) for an additional 18 months. Due to Haiti’s cholera epidemic, food insecurity, and ongoing recovery from natural disasters, Haitians cannot be safely returned to Haiti at this time. Returning the thousands who have received TPS to Haiti could contribute to destabilizing the small nation and could potentially bring harm to those returned. I believe our nation has a moral responsibility to provide continued temporary protection until Haitians’ return and reintegration can be safely accomplished. 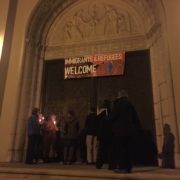 As a Catholic, I work to advance the common good and treat my neighbor how I would want to be treated. Consequently, I ask you to extend TPS and offer our Haitian community members the protection they need. What is driving people from Central America? Who will hold the U.S. accountable for a rush to deport the most vulnerable?